Hybrid System ventilation is the newest thing in Natural Ventilation. A Hyrbid system uses natural ventilation techniques when the weather and environmental conditions permit, and powered ventilation and HVAC solutions when they don't. Sophisticated computer control systems determine the right conditions and adjust the system accordingly. This allows for natural ventilation to work in facilities where it may have previously been possible. 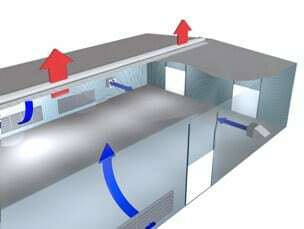 Hybrid ventilation is on the rise in office towers and commercial buildings. At Moffitt, we've been utilizing a version of this method for years in our Pressure Gravity Systems. Contact us today and we'll find you the best hybrid ventilation system possible for your facility.